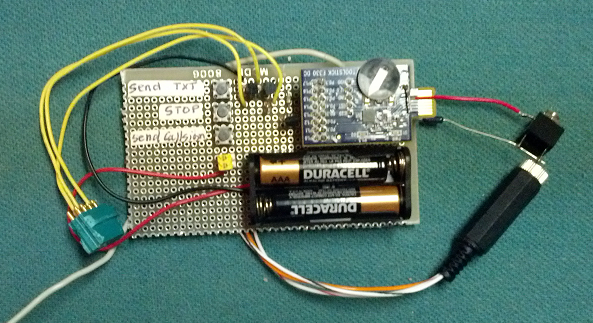 This keyer uses a Silabs 8051F330 microcontroller on a Toolstick to produce properly timed Morse characters and a sidetone. The 8051F330 is normally only available as a leadless package, which makes prototyping impossible. Silabs discontinued the convenient 20 pin DIP package years ago. The Toolstick resolves that issue at a modest increase in cost. You may still find the 8051F330 in a 20 pin DIP package on eBay, apparently overstock now resold from China. I have bought over 20 of these parts on eBay in the last 6 months and all those that I tested work fine. YMMV. The speed is adjustable via potentiometer while the sidetone is created by Direct Digital Synthesis using the processor's built-in DAC, producing a clean sinewave that can be used to drive an SSB transmitter. The keyer also supports a serial port which can be used to receive text strings sent from a computer to generate clean CW without the timing issues usually associated with using a PC for Morse code generation. The source code for the project (Version 1.0.1) is here. NOTE: This is a work in progress, not intended as a finished product. Not everything may work as expected. As you can see if you look in the code, it contains my callsign and other callsigns embedded in the code, so it is definitely not intended to be used as-is. It is written for the Keil compiler, but it can easily be converted to the free SDCC compiler, see my Wiki page about 8051 development tools.